Move over, Monopoly. A new generation of designers is bringing the board game up out of the basement. IN NEW ENGLAND, the year is 1621 -- but put aside those grade-school lessons about a community learning to value cooperation and express thankfulness. As soon as the Palmers, Winslows, and Howlands set foot on Plymouth Rock, they scramble for plots of land, marshal their limited resources to expand their homesteads, and quickly discover the neighbors encroaching on their turf. Life is full of difficult choices: Raising a barn can keep a family from developing its fields, which may mean no crops -- and no six points. "Two great American design partners have shown us a new world," Games Magazine raved when it recently declared New England its Traditional Game of the Year. Real estate development was a familiar theme of games before Monopoly. But what's new about New England, which was released in August, is an ingenious mechanism that decides the order of play. At the beginning of each round, players bid for the first move while setting prices for the game's cards and tiles. For Alan R. Moon and Aaron Weissblum, the independent game designers from Boston's North Shore who devised New England, and for a growing subculture of enthusiasts, the Games announcement is occasion for celebration, fierce debate over the award's merits, and maybe a modest spike in sales. But beyond these spielfrieks -- the term comes from Germany, where New England was published in April -- few Americans are likely to take notice. Moon and Weissblum have little chance of cracking the small canon of ancient stalwarts (chess, pachisi) and modern classics (Scrabble, Monopoly, Trivial Pursuit) that we think about when we think about board games. Even as PlayStations and computer games from The Sims to Half-Life affirm the place of games in the palace of American culture, "traditional" games have been relegated to the mildewing basement and dusty garage. Board games are most often seen as totems of a bygone era when families ate dinner together, as wholesome diversions for children, or as symptoms of arrested development. (Before Columbine's Doom-playing killers, the creepy guys in high school were the ones packing 12-sided dice and planning an assault on the Eastern Front.) The notion that "a game is a work of art as worthy of being signed as a painting, a book, or a musical composition" requires as spirited a defense today as when Sid Sackson, the gifted designer, critic, and collector who died last year, made that assertion in 1969, or when Carl Jung called inventing a good game "one of the most difficult tasks men can perform, however much others may despise it." While board games have long captured the attention of antiquarians and the odd anthropologist or mathematician, they haven't found much of a scholarly niche. Bruce Whitehill, a Rhode Island collector and lay historian who styles himself The Big Game Hunter, may be collecting abstracts for the seventh International Colloquium on Board Game Studies (to be held in Philadelphia this April), but the field of game studies has not coalesced. And cultural historians who see old games as colorful reflections of popular trends often fail to recognize that a board game, even a dull one, is more than a charming cardboard box and some pieces; it's also a set of rules and the intangible interactions that become fully apparent only in the midst of play. The growth of video games into a $10 billion a year industry has spawned "ludologists" who study digital games, but "very few of them have acknowledged even the existence of board games," says Katie Salen, a professor at the Parsons School of Design and coauthor of "Rules of Play" (MIT), a textbook for designers of all kinds of games. The feeling is mutual -- some American spielfrieks celebrate the objects of their affection and the social occasions they provide with a Luddite zeal. As with other folk arts, the inventors of board games are largely unsung individuals whose creations express individual philosophy and style. In 1860, a Springfield lithographer named Milton Bradley printed up copies of The Checkered Game of Life, which became a national success. Laid out on a checkerboard, it served as an instrument of moral education; landing on the square marked Industry allowed players to jump forward to Wealth, but stumbling onto Idleness sent them backtracking to Disgrace. Devout Protestants like Bradley reviled the American penchant for gambling, so players spun a teetotum, a top with numbered sides, instead of rolling dice. Milton Bradley has long since become the name of a corporate brand. The German board games that fill the shelves at specialty stores like Cambridge's Games People Play may proclaim their individual creators' names on the front of the box, but American products are presented as if they sprung fully formed from the collective mind of a company. "Manufacturers have done their best to suppress the consumer's knowledge that real people invented these things," says Philip Orbanes, author of "The Game Makers: The Story of Parker Brothers from Tiddledy Winks to Trivial Pursuit" (Harvard Business School Press). In 1883, 16-year-old George S. Parker devised and printed a game called Banking. Parker Brothers soon set up shop in Salem, where it remained until it was bought out in 1991, but the inventiveness behind the firm's longevity had mostly to do with production, marketing, and distribution. "By the time the 1890s came about, they were finding almost all their games from the outside world, whether from England or small companies or individual inventors," says Orbanes. Aaron Weissblum says people don't know what to make of him when he says he's a game designer. Often, they mention someone they know who came up with a board game of their own on the side. "Most of those people really haven't designed games, they've just taken a Monopoly board and changed the spaces," he says. American companies -- led by Hasbro, which controls Milton Bradley, Parker Brothers, and the lion's share of the market -- take a similar tack, preferring licensed spins on familiar favorites (my local Barnes & Noble carries "Simpsons" Chess and the aptly titled Yankees Monopoly) to the unproven unknown. So game designers like Moon and Weissblum find themselves in a similar position to poets or jazz musicians who command a sliver of market share, albeit without the cultural respect. Like sidemen working the summer festival circuit, game designers look abroad for a more receptive audience. Without question, Germany has become the world's leading incubator of board games. The country produces strategic, family-oriented titles with less linear movement than Monopoly, less dead time than Scrabble, and more durable components than usually found in American games. "In Germany, all of the newspapers over there carry columns on games on a weekly basis," says Moon. What's more, he says, "people will actually sit there and read the rules. In America, nobody wants to read rules." There are exceptions: A decade or so ago, a handful of Americans got wind of the German games and translated rules began appearing on the Internet. Moon, who took home the coveted Spiel des Jahres (Game of the Year) in 1998, brings together a couple hundred friends each year in Columbus, Ohio, for a nine-day-long board-game binge, helping to foster a taste for what he calls "designer games." Today, English-language versions average sales of a few thousand units, with the top sellers in the tens of thousands. That's small beer for Hasbro, but the company is plainly aware of the strength of the designs. It commissioned Germany's most prolific designer, Reiner Knizia, to develop its tie-ins to the "Lord of the Rings" films. The German style is slowly making inroads beyond spielfriek circles, but seeing board games as an art form worthy of preservation remains a formidable challenge. Nobody would take Sid Sackson's singular collection of games, boards, and pieces when it was dispersed after his death last year. Elliott Avedon, a professor emeritus of recreation and leisure studies at Canada's University of Waterloo, founded the only game museum in North America. Though he retired to Florida in 1995, he still hasn't found someone to take over the place. "Any new young faculty members who come along, they don't have interest," he says. "If I win the lottery, I would endow a chair." Blake Eskin is the editor of Nextbook.org, and author of "A Life in Pieces: The Making and Unmaking of Binjamin Wilkomirski." Most designer games require at least three players, take no more than 90 minutes to play, and can be enjoyed by adults and older children. They probably aren't in the larger toy chains; try specialty stores like Funagain Games (funagain.com) or Games People Play in Harvard Square. For further suggestions, consult Games magazine's December issue, which includes its top 100 games for 2004. 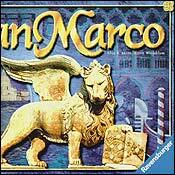 San Marco, by Alan R. Moon and Aaron Weissblum (Ravensburger, $35). In this early venture by the team behind New England, Venetian aristocrats maneuver across the canals in a struggle to curry favor with the Doge. The key mechanism is a nifty twist on what game theory calls the Cake Division problem: One person splits up a handful of cards, and another chooses who gets which pile. 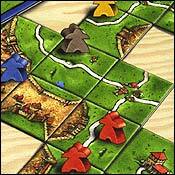 Carcassonne, by Klaus-Jrgen Wrede (Rio Grande/Hans im Glck, $19.95). Named for the walled medieval city in the south of France, Carcassonne is a cross between a board game and dominos. Players take turns laying down square tiles with varied landscape features, creating a network of roads, fields, and cloisters. Since two can play and the rules are simpler than other German family strategy games, spielfrieks recommend it as an introduction to the genre. The Settlers of Catan (Die Siedler von Catan) (Mayfair Games, $38). The board consists of 37 hexagonal tiles assembled to create a fictional island where players build roads and trade commodities. Since winning German Game of the Year honors in 1995, Settlers has sold millions of copies worldwide and become the most popular German title in the United States. Uberplay, the company behind New England, tailored a religious-themed edition for Mormons, who set aside Monday evenings as family time. I'm the Boss, by Sid Sackson (Face 2 Face, $34.95). 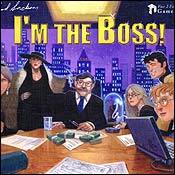 Published in Germany a decade ago as Kohle Kies & Knete, I'm the Boss is the English-language debut of this title by the late designer and collector Sid Sackson, who had a gift for business games. (He's best known for Acquire, which 3M published in the 1960s.) In I'm the Boss, up to six sleazy investors negotiate a series of deals, making temporary alliances but undermining or hijacking one another at the last moment. Named Best Family Game by Games Magazine.